Capra was nominated six times for Best Director Oscars, and took home three of the statuettes over the course of his career. Only John Ford ever bettered this record-- he won four. 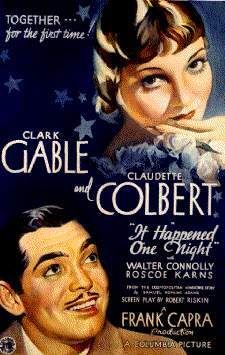 A poster from the Best Picture of 1934, IT HAPPENED ONE NIGHT, starring Clark Gable and Claudette Colbert, for which Capra took his first Best Director award. This was the first picture in the history of The Academy of Motion Picture Arts and Sciences to receive all of the "Big Five" awards: Best Picture, Actor, Actress, Director, and Writing. A poster from MR. 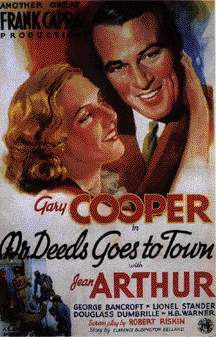 DEEDS GOES TO TOWN with Jean Arthur and Gary Cooper. 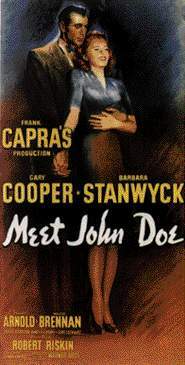 Capra won the 1936 Oscar for Best Director, and the film was also nominated for Best Picture. Posters from MEET JOHN DOE (1941) with Gary Cooper and Barbara Stanwyck, and ARSENIC AND OLD LACE (1944) with Cary Grant and Peter Lorre.